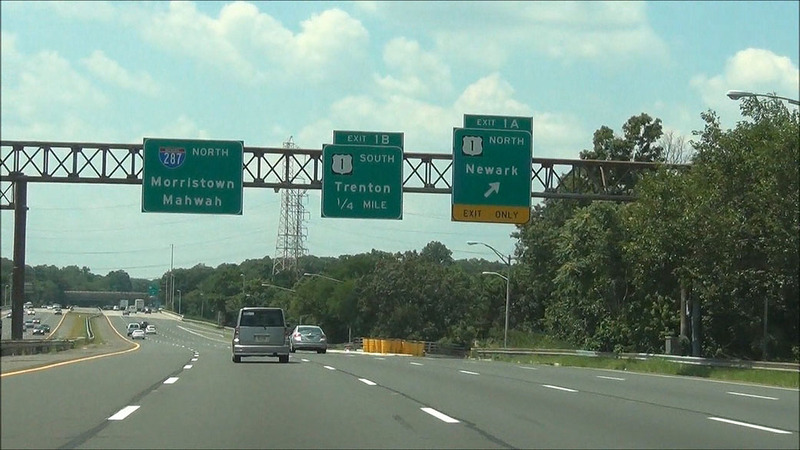 Interstate 287 North at Exit 1A: US 1 North - Newark (Photo taken 7/24/12). 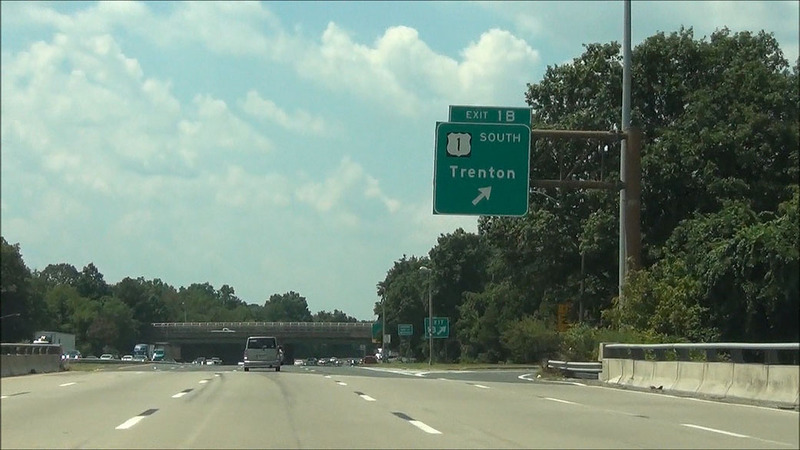 Interstate 287 North at Exit 1B: US 1 South - Trenton (Photo taken 7/24/12). Speed limit sign near mile marker 2. 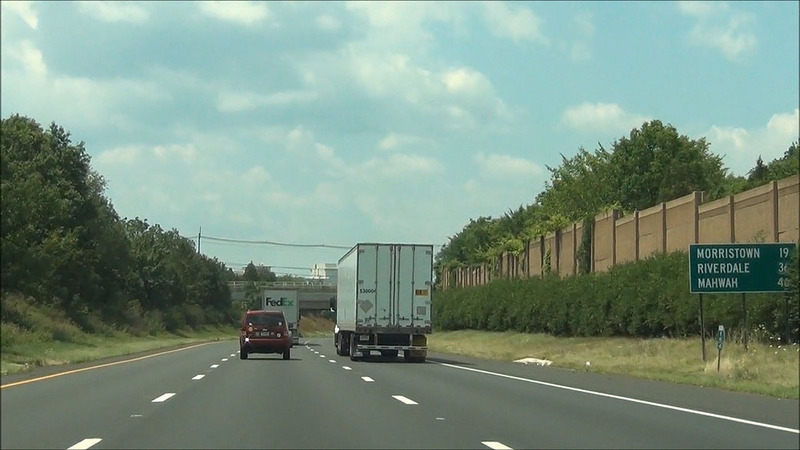 The speed limit on most New Jersey Interstates is 65 mph, unless near a congested area. (Photo taken 7/24/12). 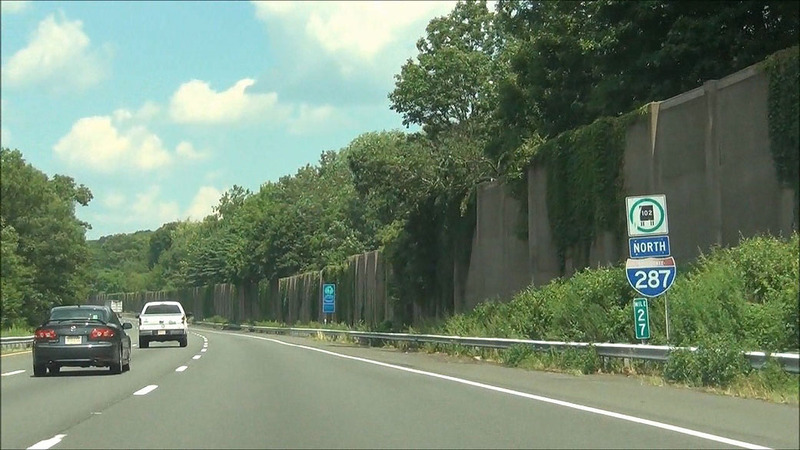 In the 65 mph speed limit zones in New Jersey, speeding and agressive driving fines are doubled. (Photo taken 7/24/12). 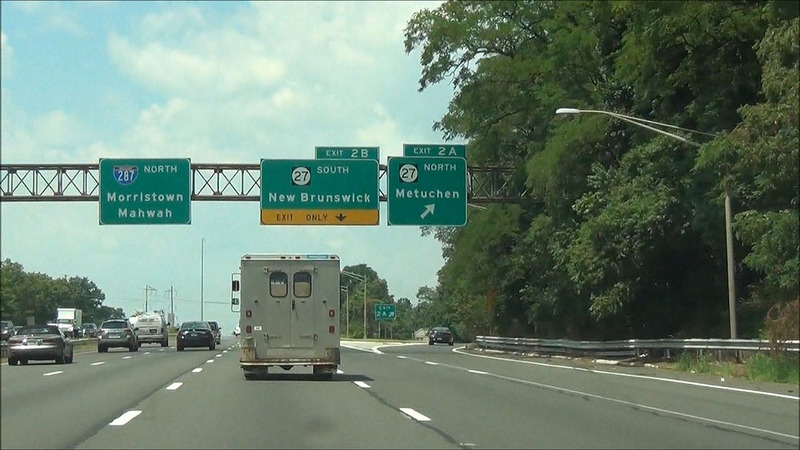 Interstate 287 North at Exit 2A: NJ 27 North - Metuchen (Photo taken 7/24/12). 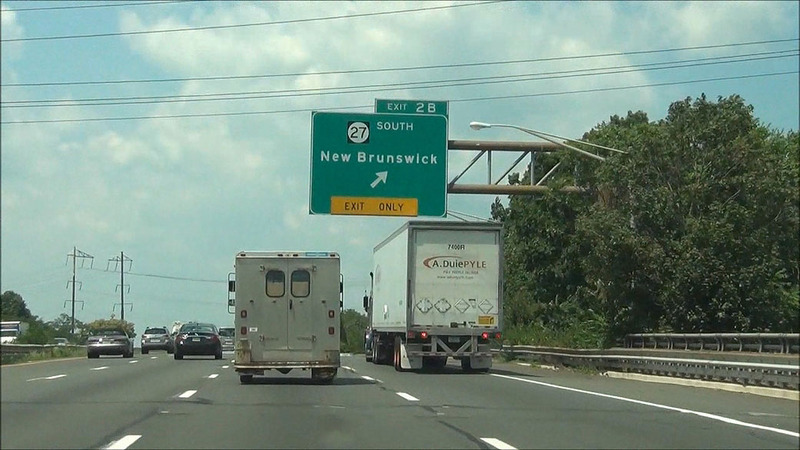 Interstate 287 North at Exit 2B: NJ 27 South - New Brunswick (Photo taken 7/24/12). 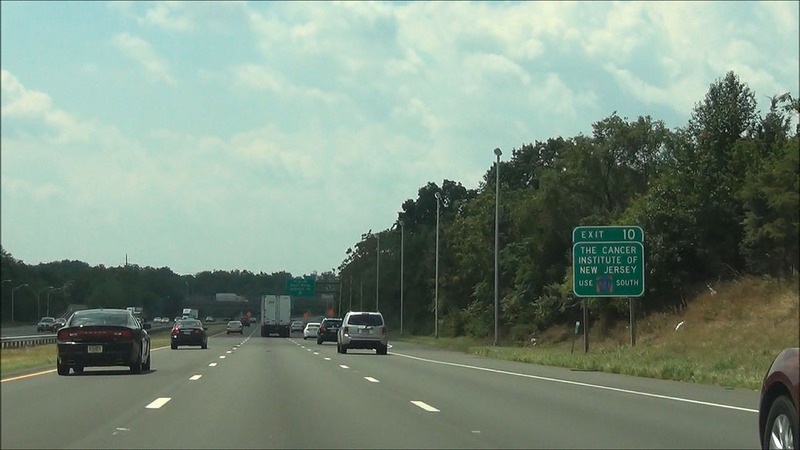 Interstate 287 North at Exit 4: Durham Ave / South Plainfield (Photo taken 7/24/12). 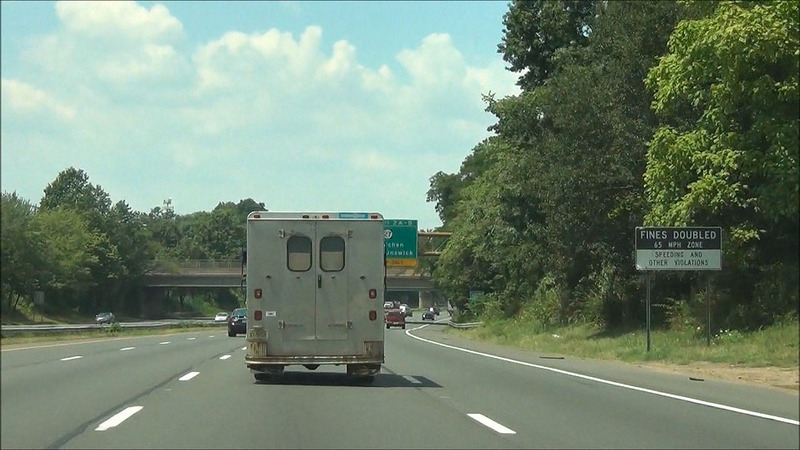 Use any of the next 5 exits to Piscataway. (Photo taken 7/24/12). 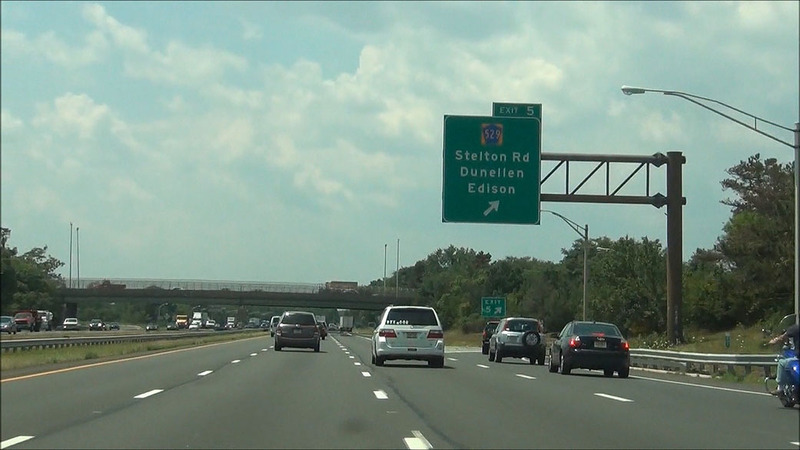 Interstate 287 North at Exit 5: CR 529 - Stelton Rd / Dunellen / Edison (Photo taken 7/24/12). 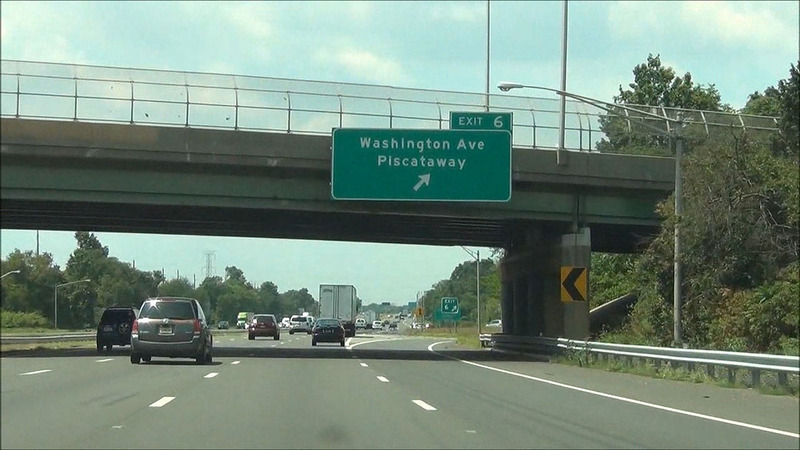 Interstate 287 North at Exit 6: Washington Ave / Piscataway (Photo taken 7/24/12). 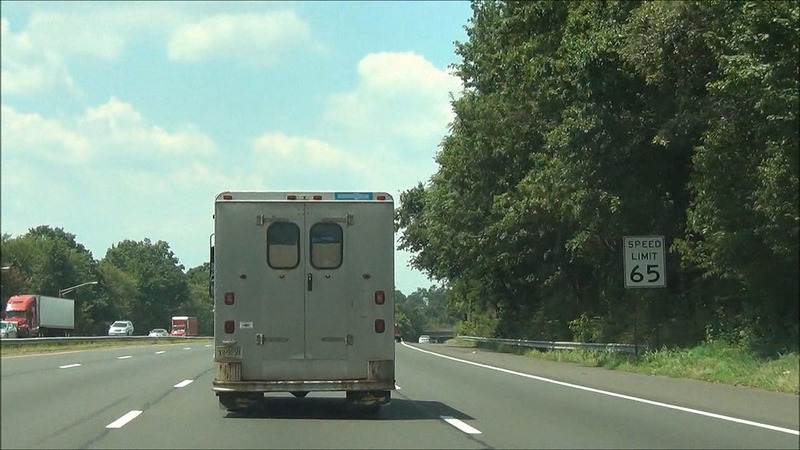 Use any of the next 3 exits to Rutgers University. (Photo taken 7/24/12). 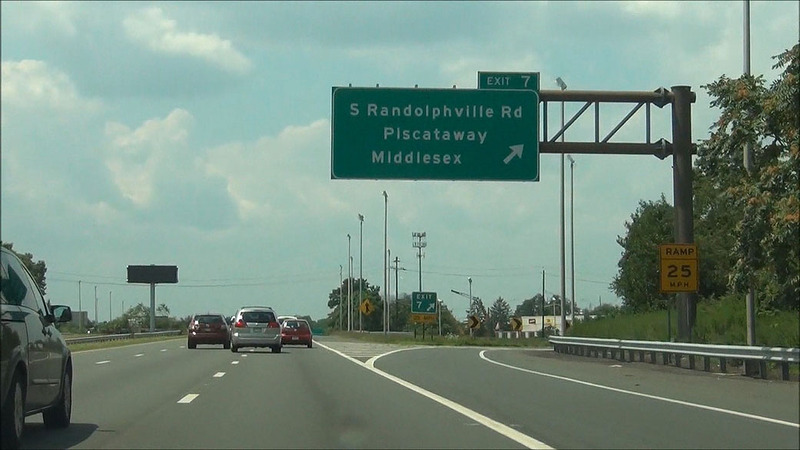 Interstate 287 North at Exit 7: South Randolphville Rd / Piscataway / Middlesex (Photo taken 7/24/12). 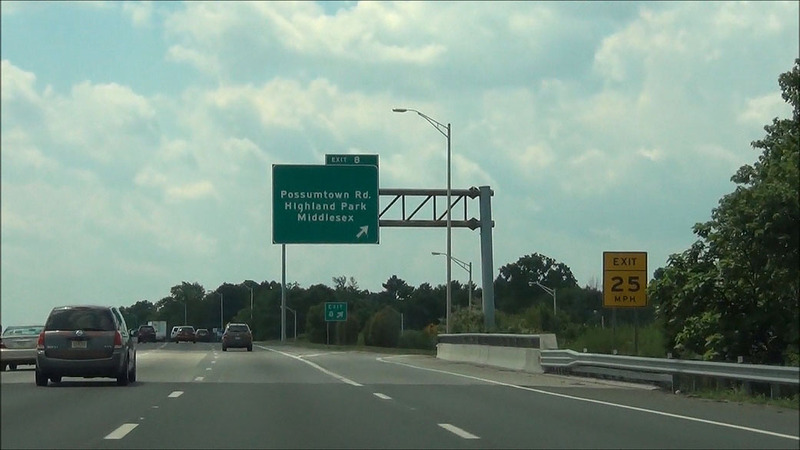 Interstate 287 North at Exit 8: Possumtown Rd / Highland Park / Middlesex (Photo taken 7/24/12). 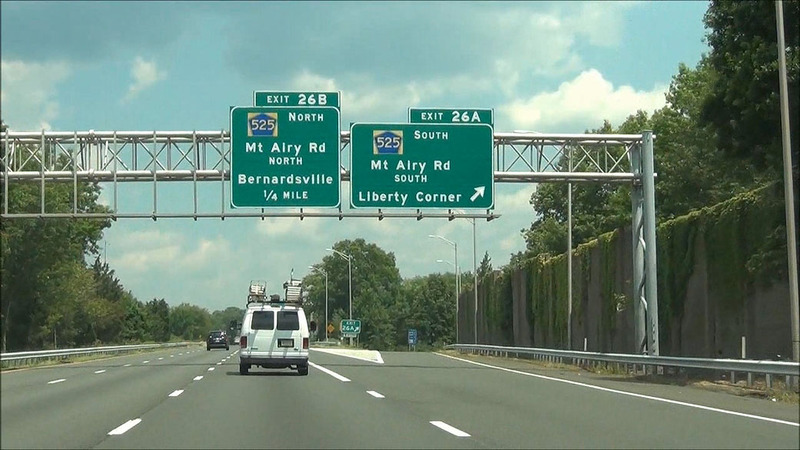 Interstate 287 North at the Weigh Station located near mile marker 9. (Photo taken 7/24/12). Use Exit 10 for The Cancer Institute of New Jersey. (Photo taken 7/24/12). 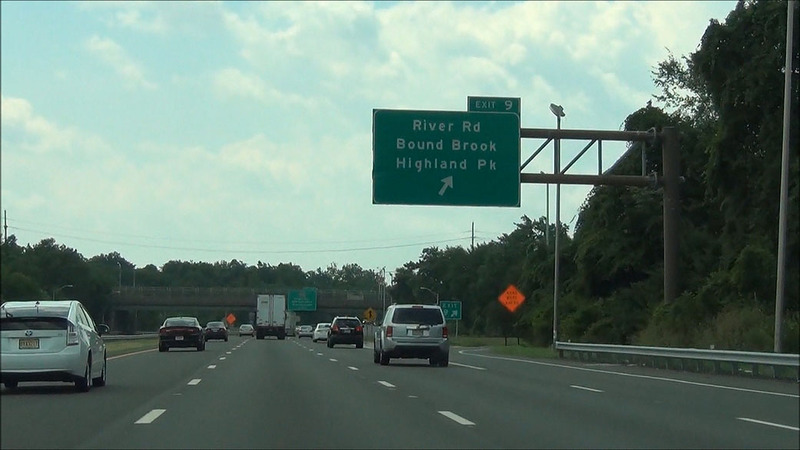 Interstate 287 North at Exit 9: River Rd / Bound Brook / Highland Park (Photo taken 7/24/12). 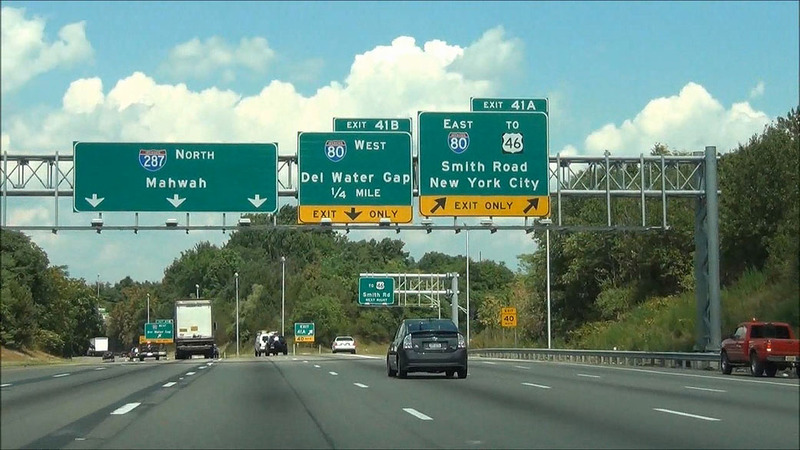 Use Exit 10 for Garden State Exibit Center and New Brunswick Theater District. (Photo taken 7/24/12). 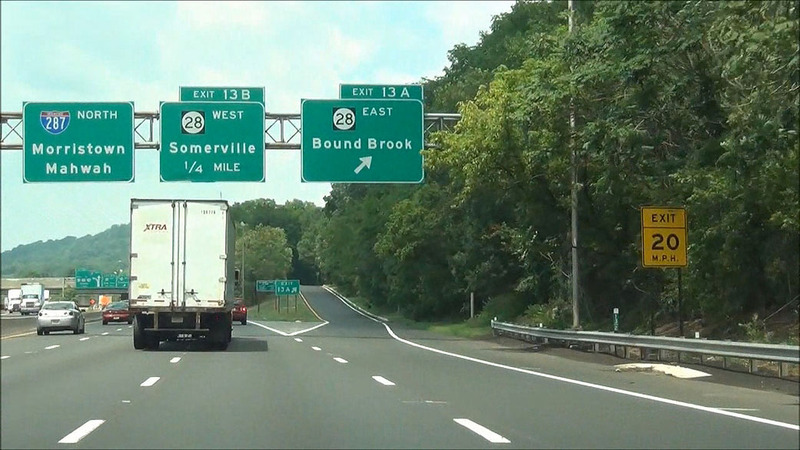 Interstate 287 North at Exit 10: CR 527 - Easton Ave / New Brunswick / South Bound Brook (Photo taken 7/24/12). Use Exit 12 to Zarephath. (Photo taken 7/24/12). 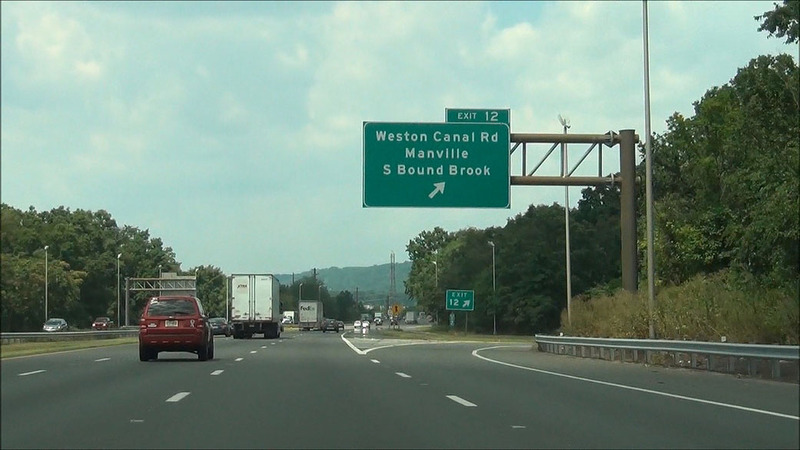 Interstate 287 North at Exit 12: Weston Canal Rd / Manville / South Bound Brook (Photo taken 7/24/12). Use Exit 13B to TD Bank Ballpark. (Photo taken 7/24/12). 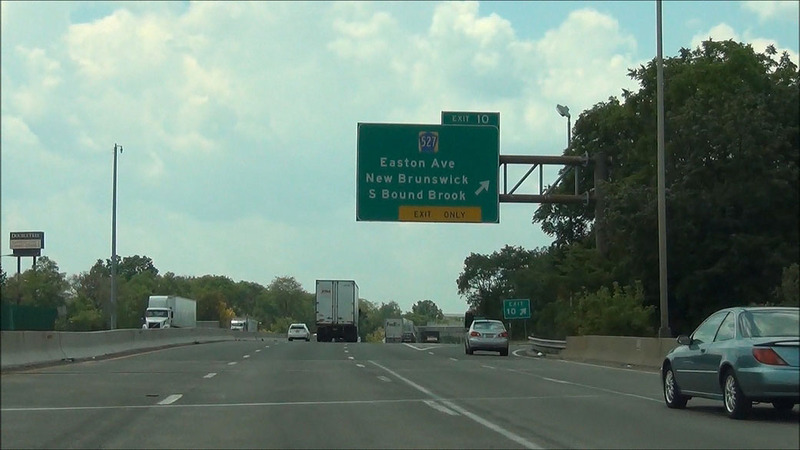 Interstate 287 North at Exit 13A: NJ 28 East - Bound Brook (Photo taken 7/24/12). 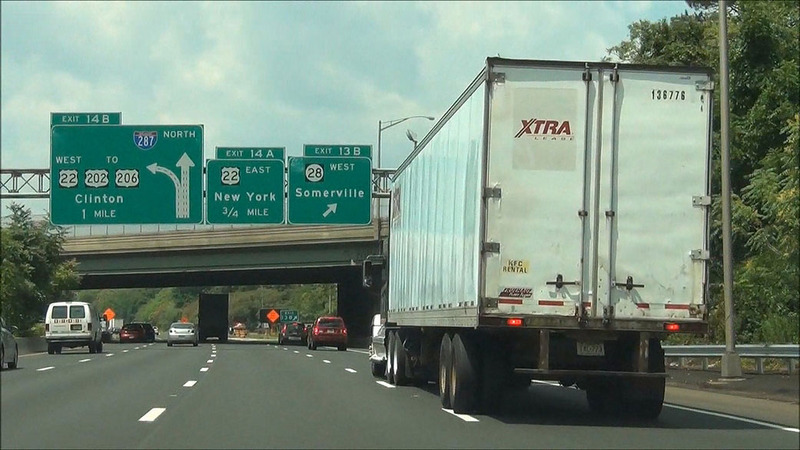 Interstate 287 North at Exit 13B: NJ 28 West - Somerville (Photo taken 7/24/12). 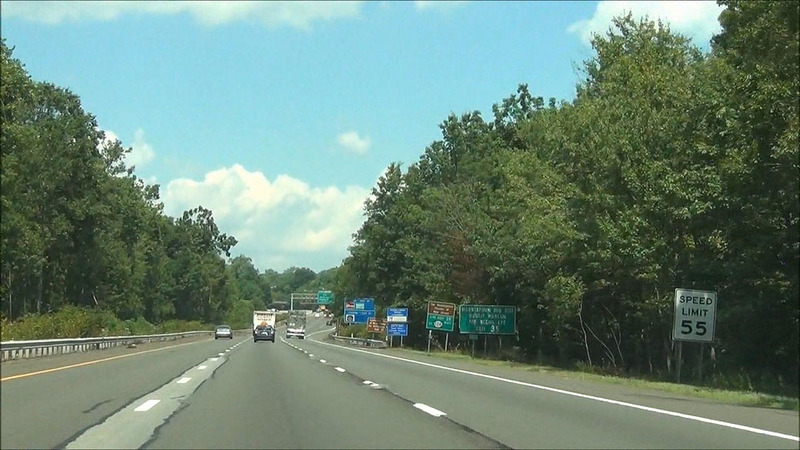 Interstate 287 North at Exit 14A: US 22 East - New York (Photo taken 7/24/12). 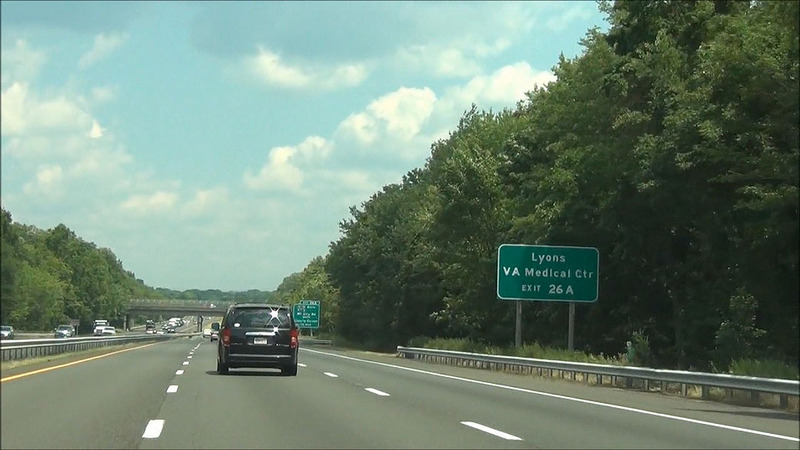 Interstate 287 North at Exit 14B: US 22 West / To US 202 / To US 206 - Clinton (Photo taken 7/24/12). Mileage sign located near mile marker 16.4. It's 19 miles to Morristown, 36 miles to Riverdale, and 46 miles to Mahwah. (Photo taken 7/24/12). 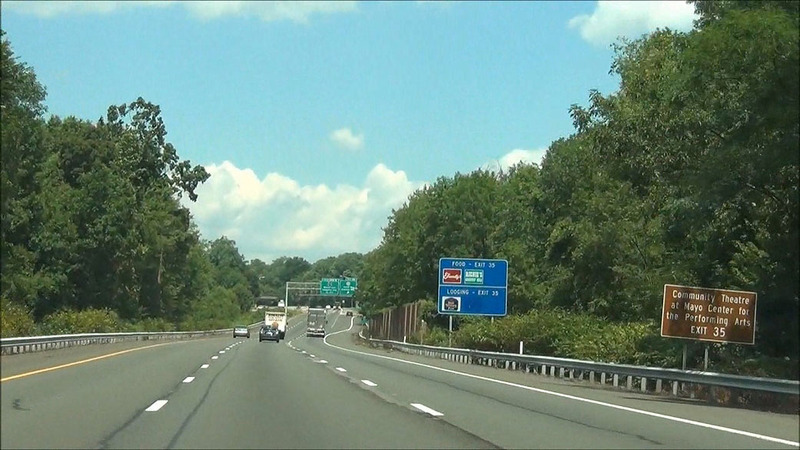 Interstate 287 North approaching the junction of Interstate 78 - 1 mile. (Photo taken 7/24/12). 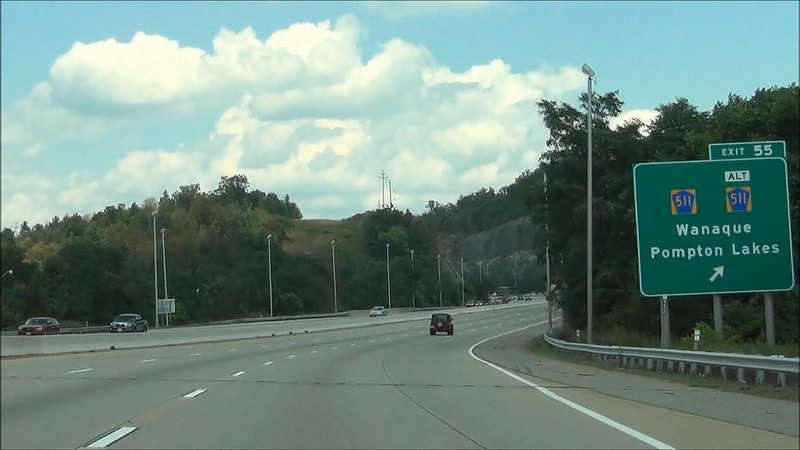 Interstate 287 North at the ramp to the local lanes, which will take you to the ramp to Interstate 78 East toward New York City. If it sounds confusing, you will understand after viewing the next few pictures. (Photo taken 7/24/12). 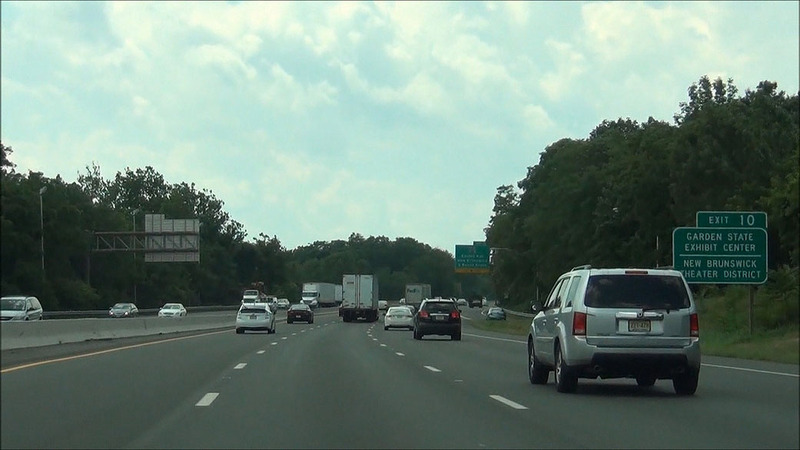 Interstate 287 North approaching Exit 21B - 1 mile. This will be a left exit. (Photo taken 7/24/12). 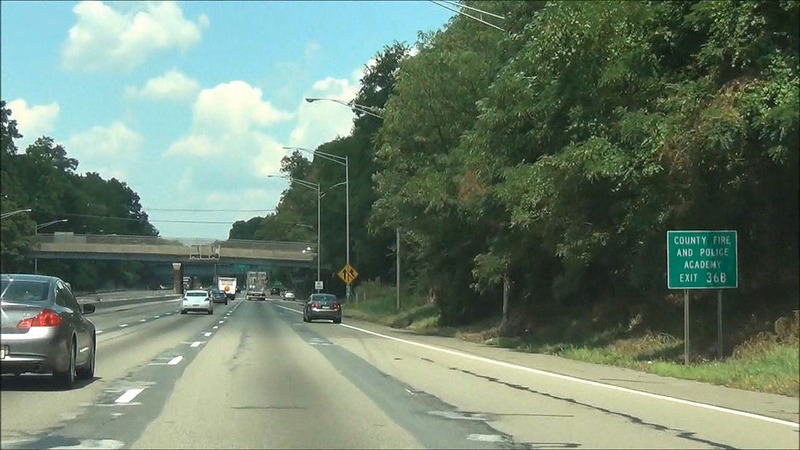 Interstate 287 North at Exit 21B - Interstate 78 West - Easton, PA. As you can see, the local lanes to the right still continue forward and Exit 21A (I-78 East) is coming up just ahead. (Photo taken 7/24/12). 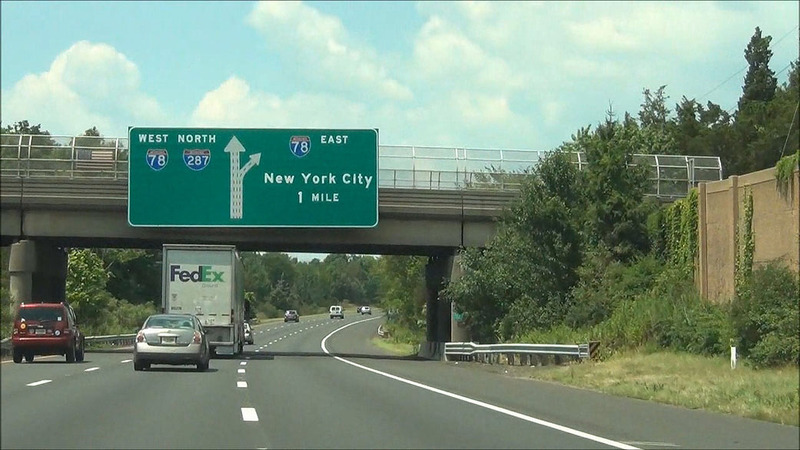 Interstate 287 North at Exit 21A: Interstate 78 East - New York City. 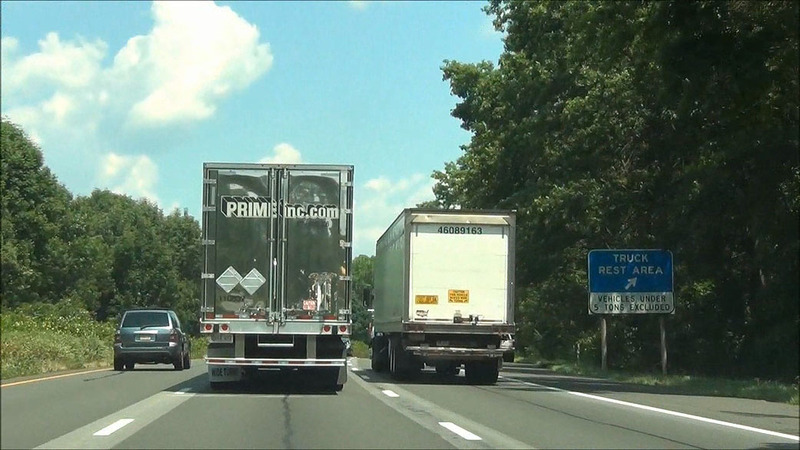 This is why the signs for I-78 East directed you into the local lanes about 1 1/2 miles back. 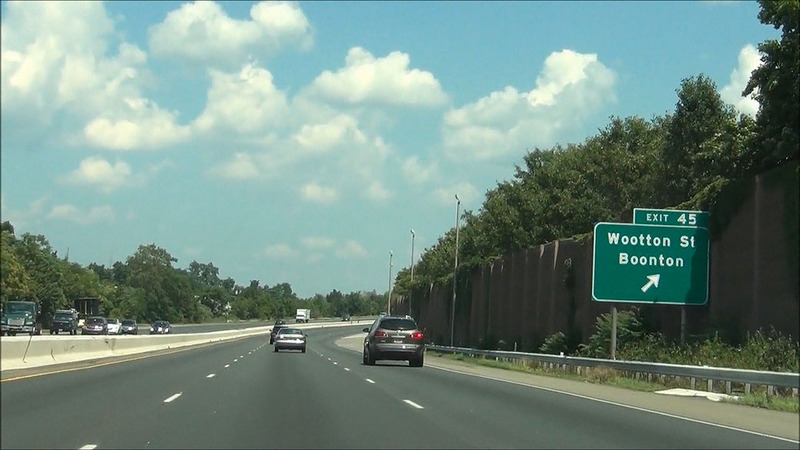 You can't get to this exit without getting in the local lanes back at that point, as you can see. (Photo taken 7/24/12). 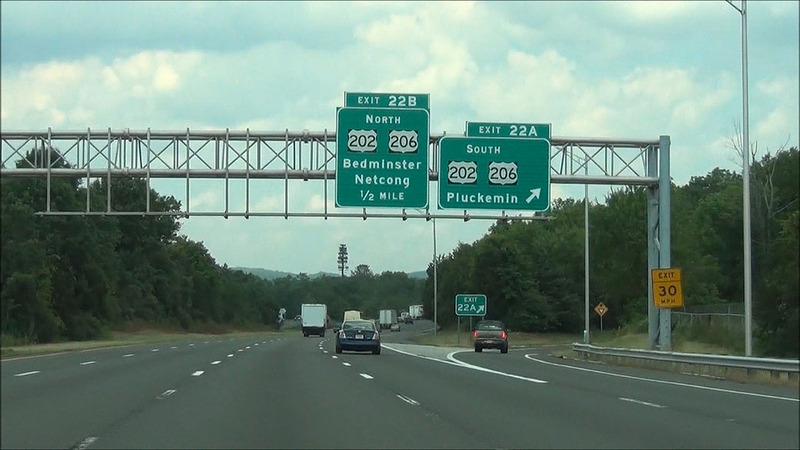 Interstate 287 North at Exit 22A: US 202 South / US 206 South - Pluckemin (Photo taken 7/24/12). 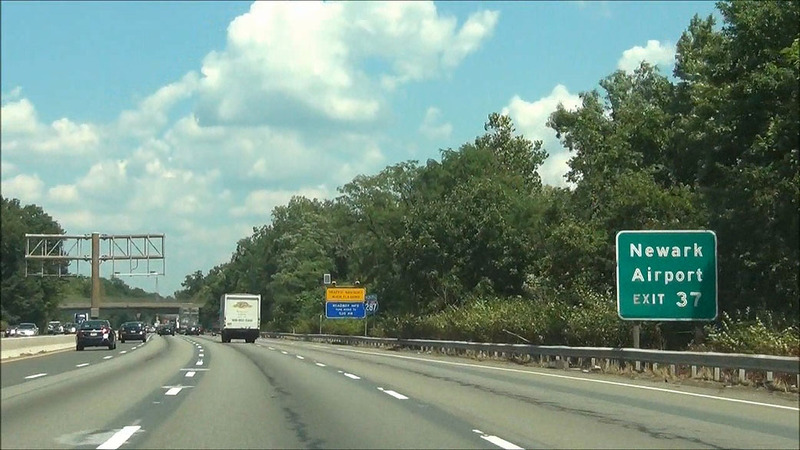 Interstate 287 North at Exit 22B: US 202 North / US 206 North - Bedminster / Netcong (Photo taken 7/24/12). Use Exit 26A for the USGA Golf Museum. (Photo taken 7/24/12). Also use Exit 26 to get to Lyons and the VA Medical Center. (Photo taken 7/24/12). 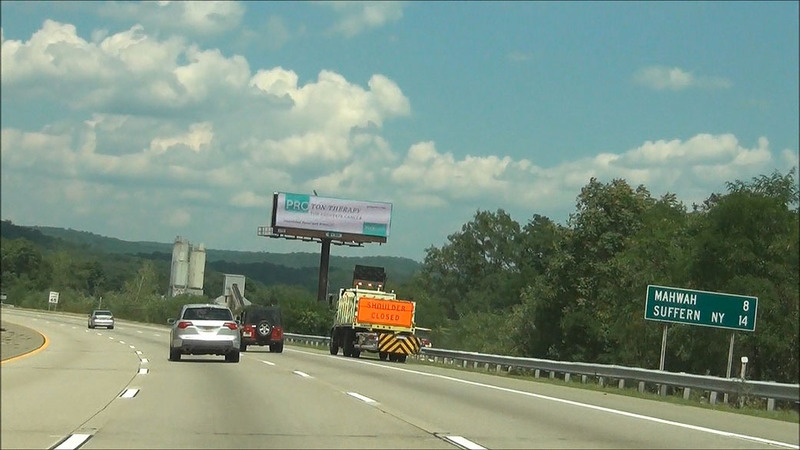 Interstate 287 North at Exit 26A: CR 525 South - Mt Airy Rd South / Liberty Corner (Photo taken 7/24/12). 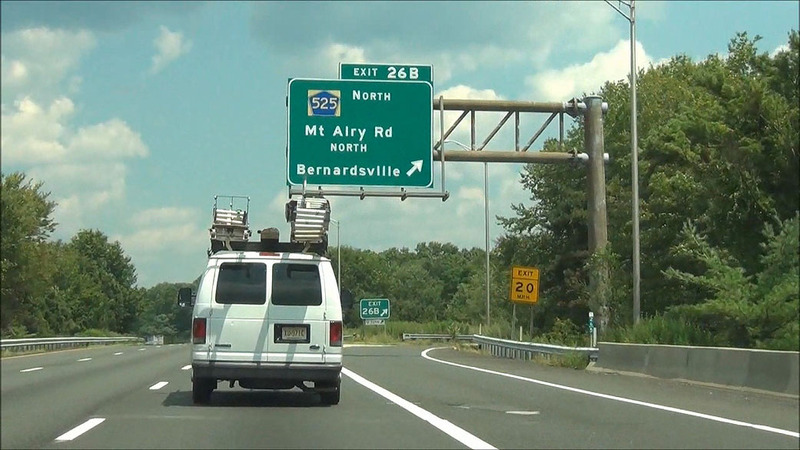 Interstate 287 North at Exit 26B: CR 525 North - Mt Airy Rd North / Bernardsville (Photo taken 7/24/12). 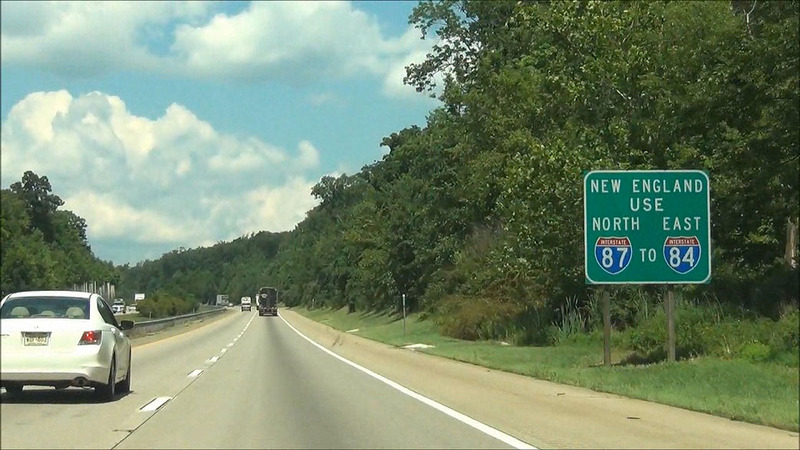 Interstate 287 North shield located at mile marker 27. (Photo taken 7/24/12). Use Exit 30A for the Great Swamp National Wildlife Refuge. (Photo taken 7/24/12). 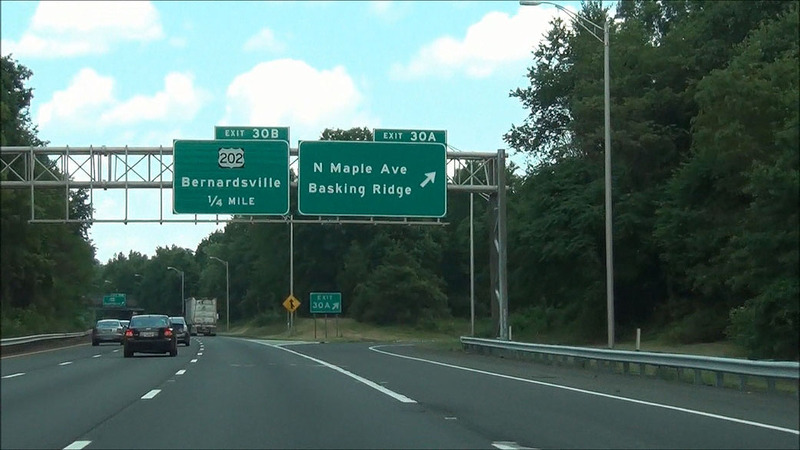 Interstate 287 North at Exit 30A: North Maple Ave / Basking Ridge (Photo taken 7/24/12). 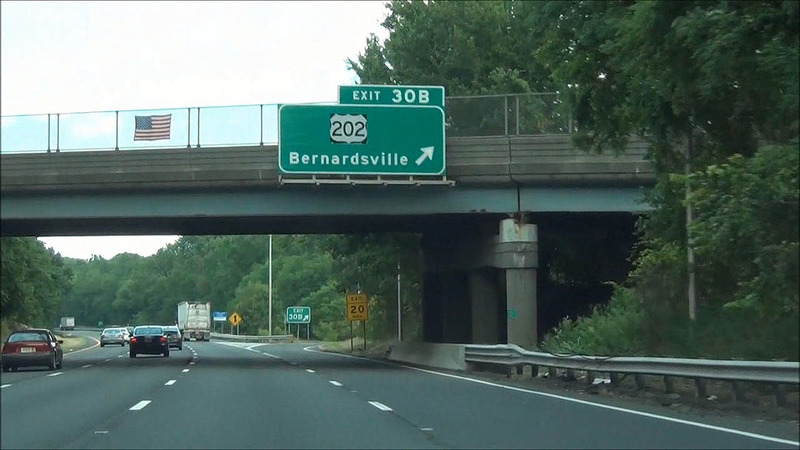 Interstate 287 North at Exit 30B: US 202 - Bernardsville (Photo taken 7/24/12). 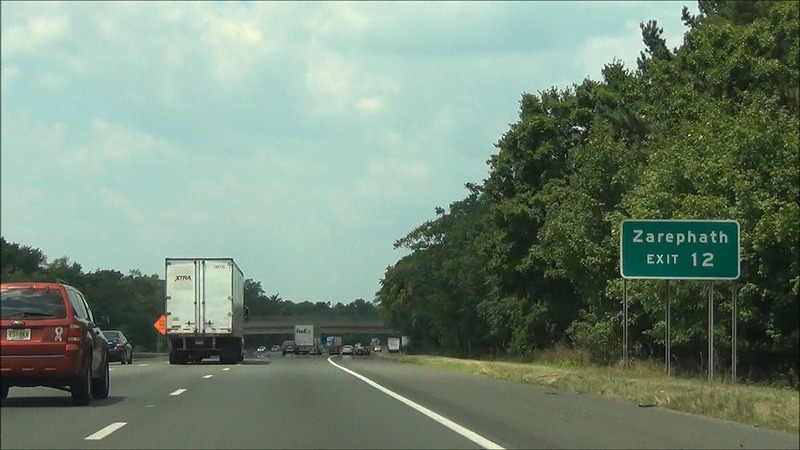 Interstate 287 North at the Truck Rest Area located at mile marker 32.5. (Photo taken 7/24/12). 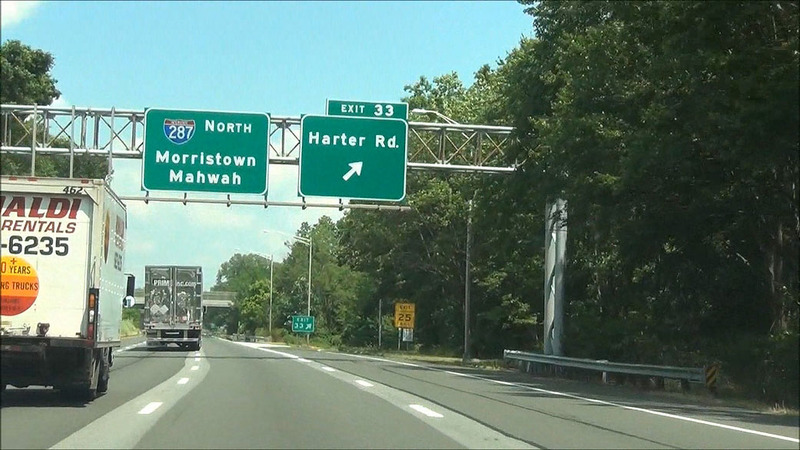 Interstate 287 North at Exit 33: Harter Rd (Photo taken 7/24/12). 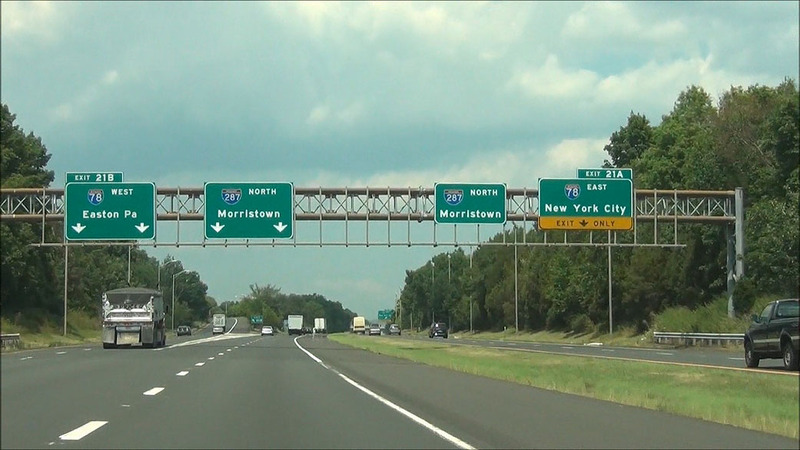 Use any of the next 3 exits to Morristown. (Photo taken 7/24/12). 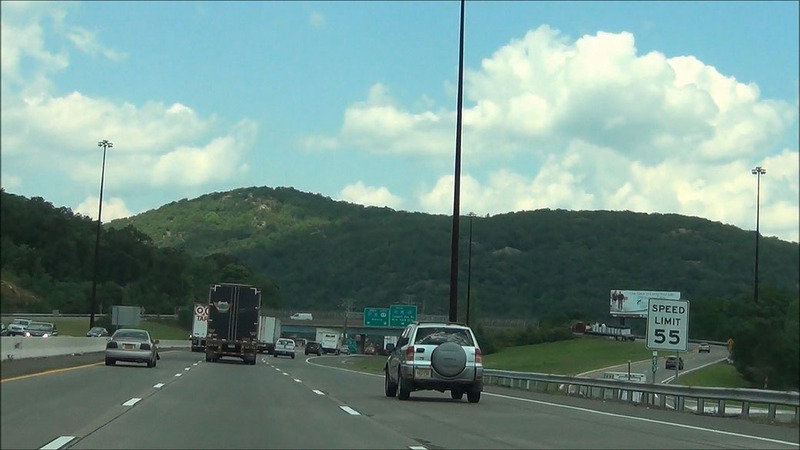 Near mile marker 35, the speed limit drops to 55 mph as you approach Morristown. (Photo taken 7/24/12). Use Exit 35 for Community Theatre at Mayo Center for the Performing Arts. (Photo taken 7/24/12). 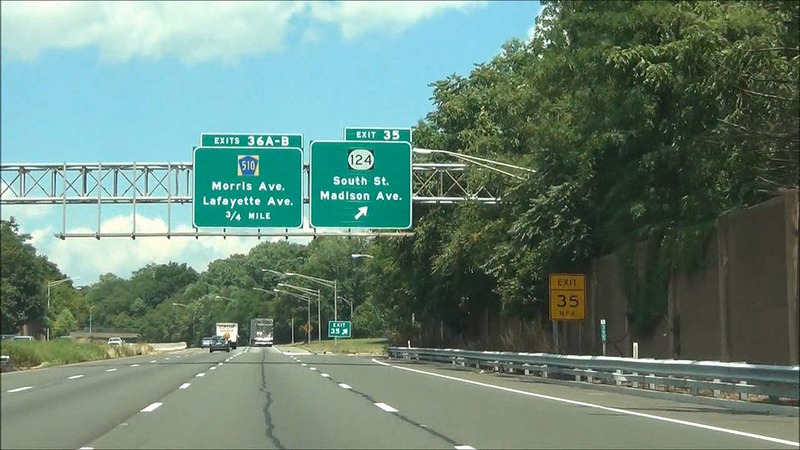 Interstate 287 North at Exit 35: NJ 124 - South St / Madison Ave (Photo taken 7/24/12). Use Exit 36B for the County Fire and Police Academy. (Photo taken 7/24/12). 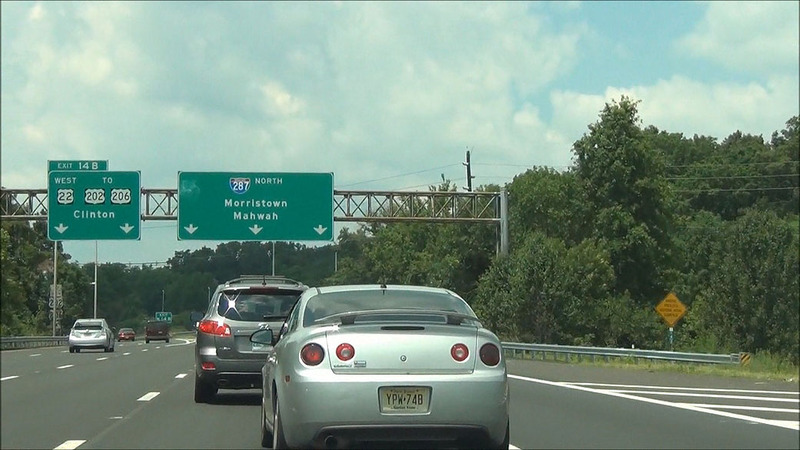 Interstate 287 North at Exit 36A: CR 510 East - Morris Ave (Photo taken 7/24/12). 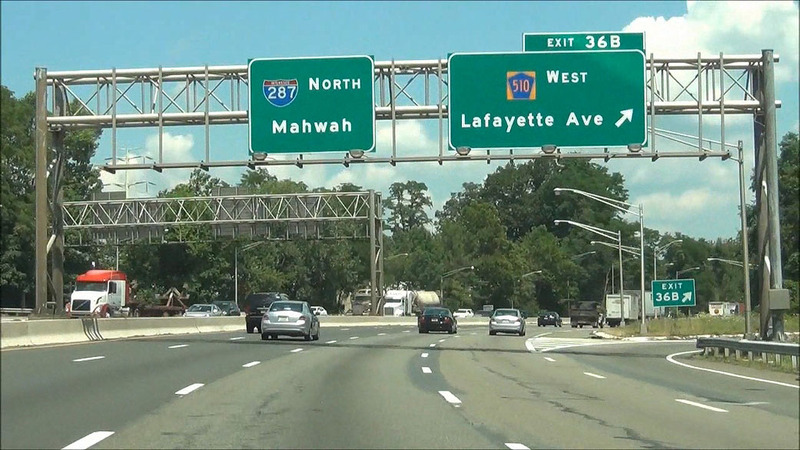 Interstate 287 North at Exit 36B: CR 510 West - Lafayette Ave (Photo taken 7/24/12). 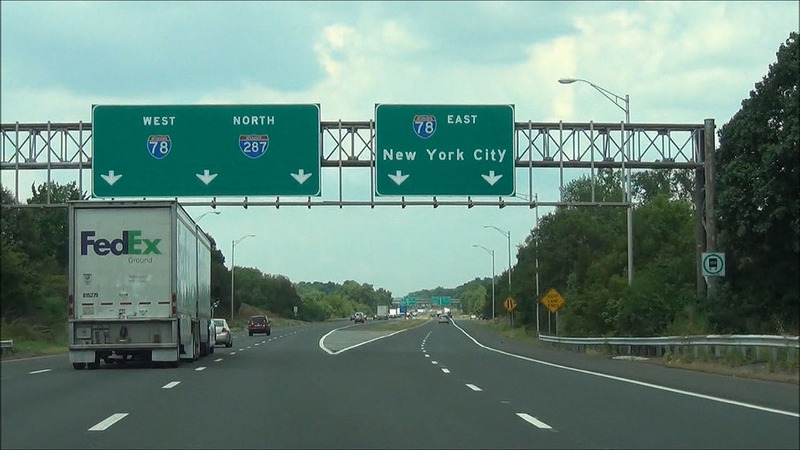 Use Exit 37 to Newark Airport. (Photo taken 7/24/12). Also use Exit 37 for Morristown Airport. (Photo taken 7/24/12). 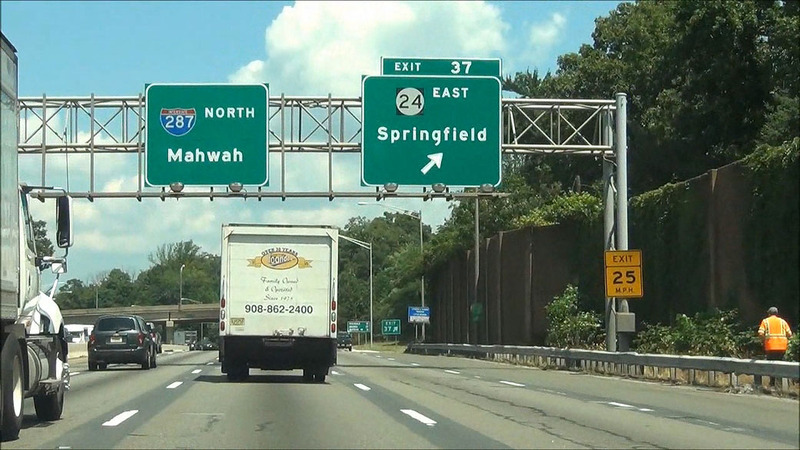 Interstate 287 North at Exit 37: NJ 24 East - Springfield (Photo taken 7/24/12). 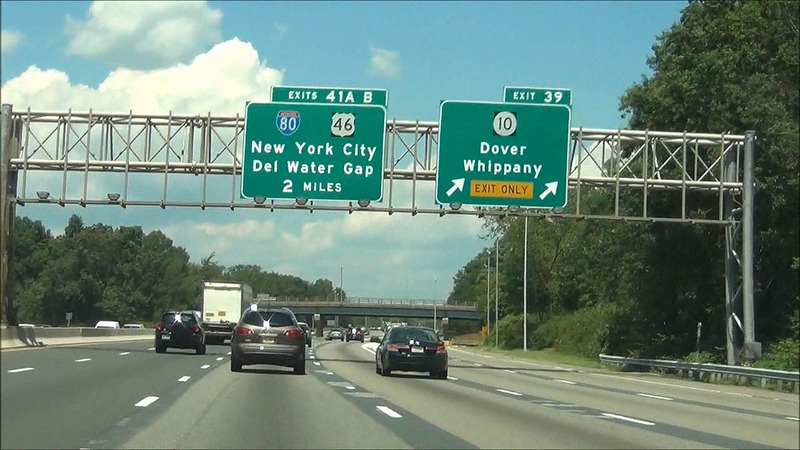 Interstate 287 North at Exit 39: NJ 10 - Dover / Whippany (Photo taken 7/24/12). 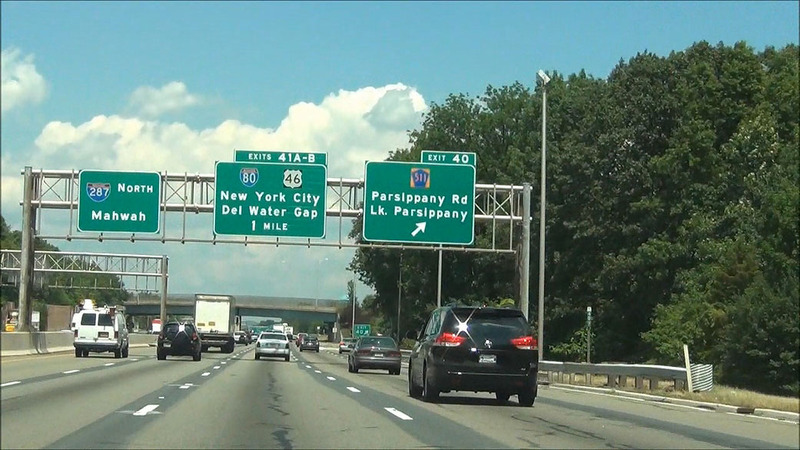 Interstate 287 North at Exit 40: CR 511 - Parsippany Rd / Lake Parsippany (Photo taken 7/24/12). 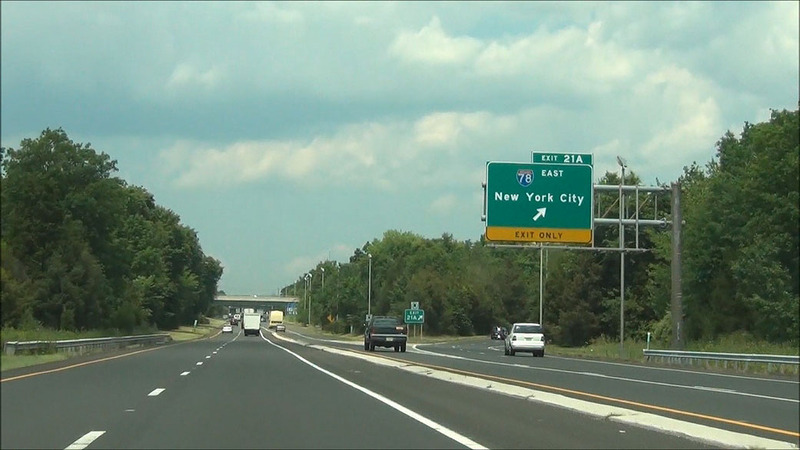 Interstate 287 North at Exit 41A: Interstate 80 East / To US 46 - Smith Road / New York City (Photo taken 7/24/12). 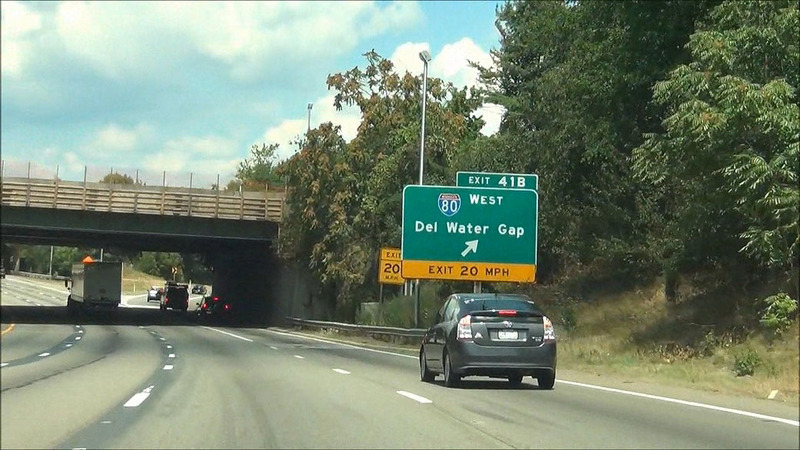 Interstate 287 North at Exit 41B: Interstate 80 West - Delaware Water Gap (Photo taken 7/24/12). 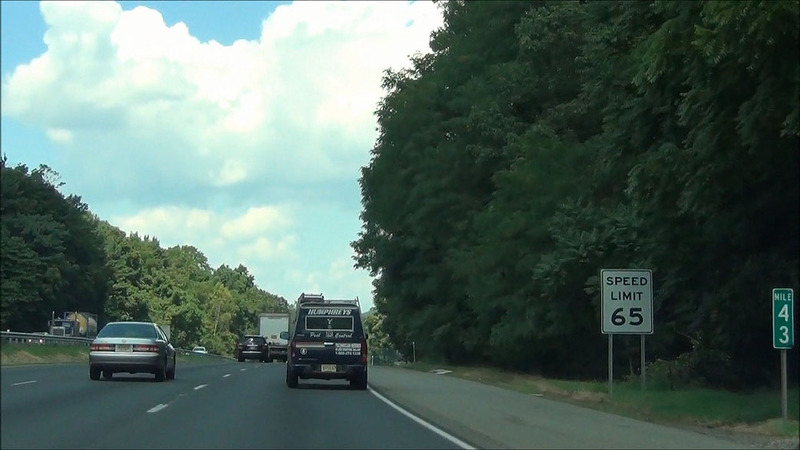 At mile marker 43, the speed limit returns to being 65 mph. (Photo taken 7/24/12). 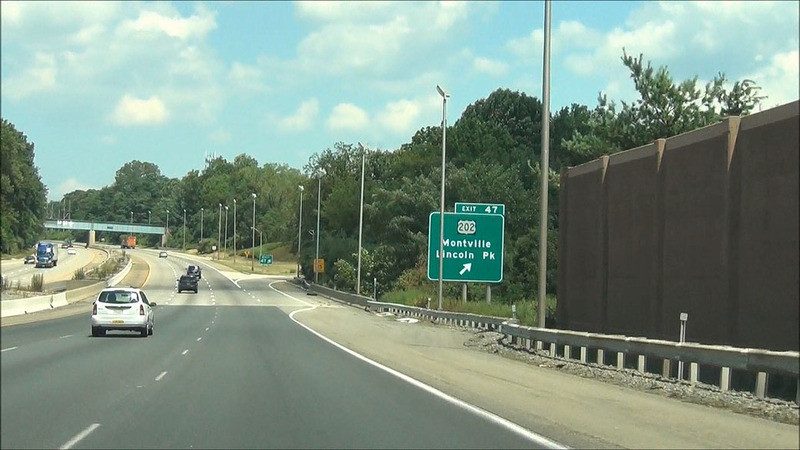 Interstate 287 North at Exit 43: Intervale Rd / Mountain Lakes (Photo taken 7/24/12). 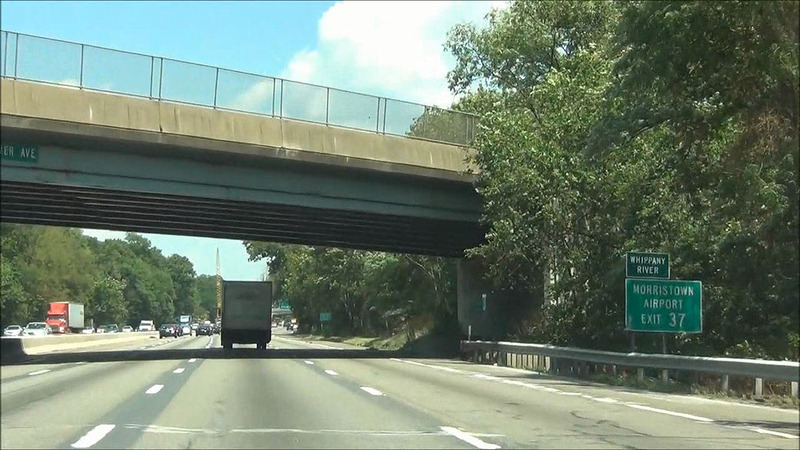 Interstate 287 North at Exit 44: Main St / Boonton (Photo taken 7/24/12). 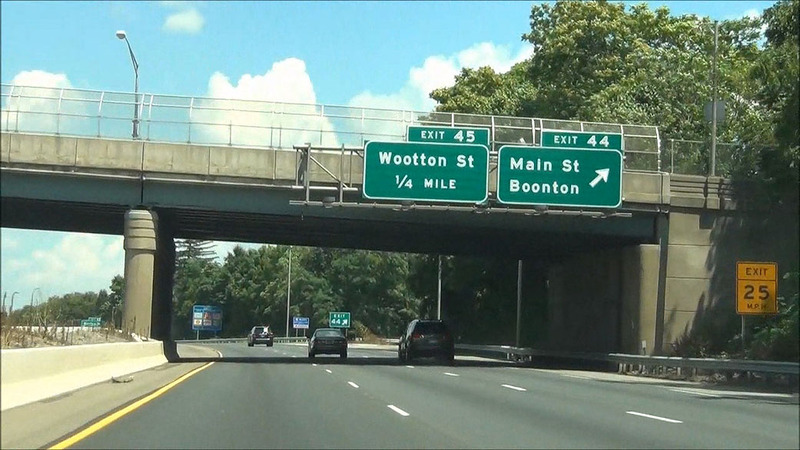 Interstate 287 North at Exit 45: Wootton St / Boonton (Photo taken 7/24/12). 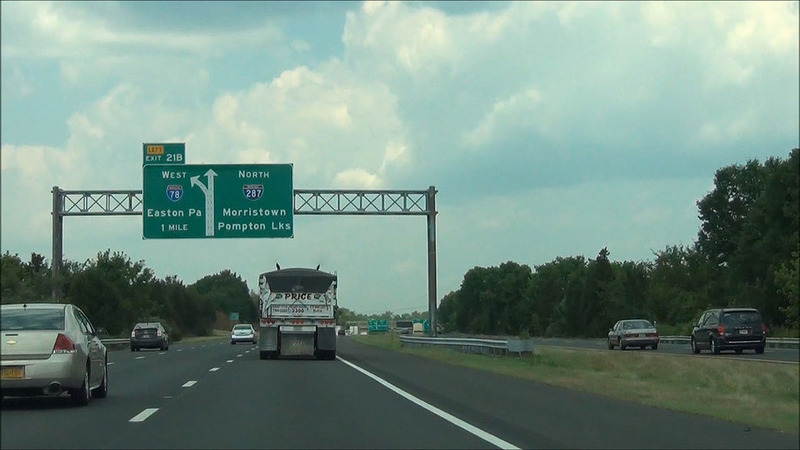 Interstate 287 North at Exit 47: US 202 - Montville / Lincoln Park (Photo taken 7/24/12). Use any of the next 3 exits to get to Riverdale. (Photo taken 7/24/12). 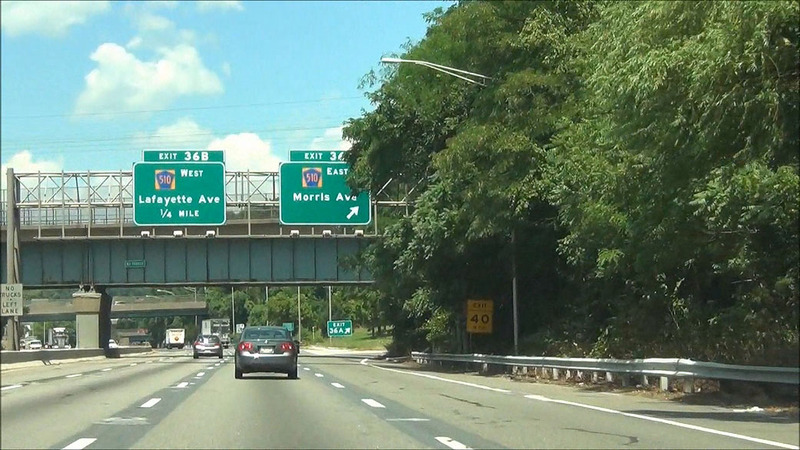 Interstate 287 North at Exit 52A: NJ 23 South - Riverdale / Wayne (Photo taken 7/24/12). 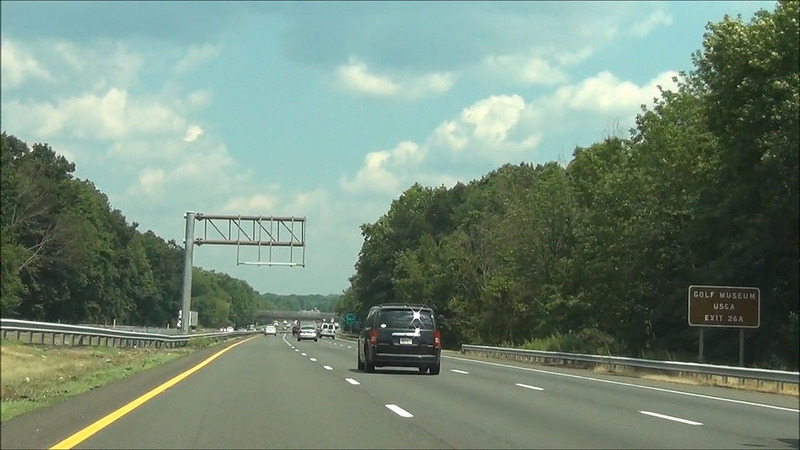 Interstate 287 North at Exit 52B: NJ 23 North - Butler (Photo taken 7/24/12). 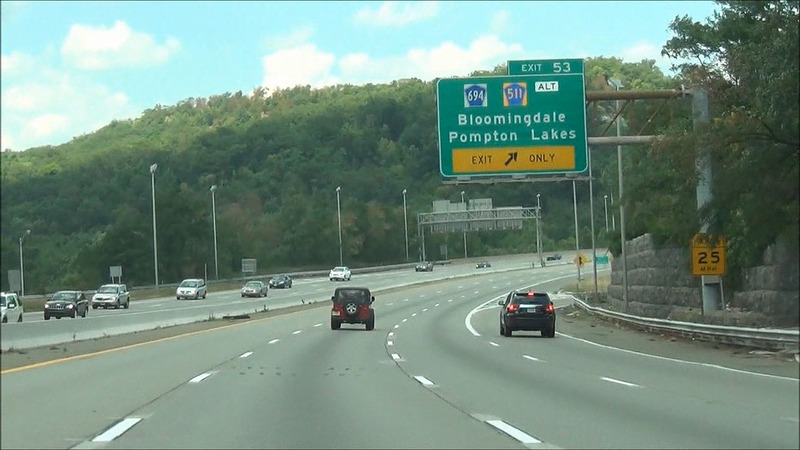 Interstate 287 North at Exit 53: CR 694 / CR 511 Alt - Bloomingdale / Pompton Lakes (Photo taken 7/24/12). Mileage sign located near mile marker 54. It's 8 miles to Mahwah and 14 miles to Suffern, NY. (Photo taken 7/24/12). 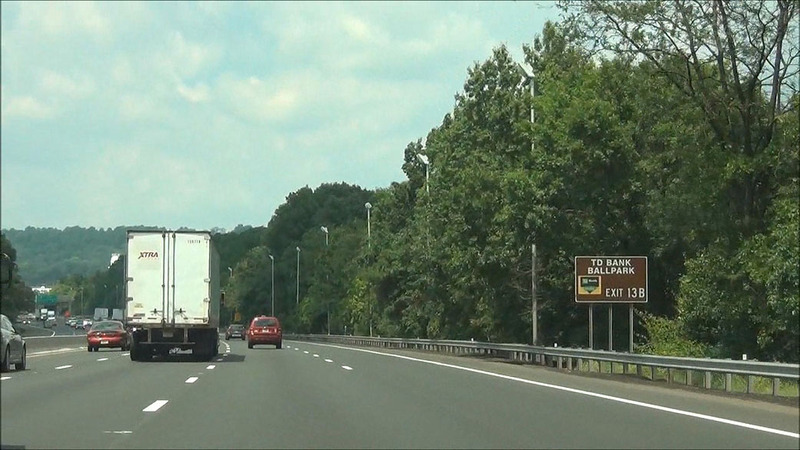 Interstate 287 North at Exit 55: CR 511 / CR 511 Alt - Wanaque / Pompton Lakes (Photo taken 7/24/12). 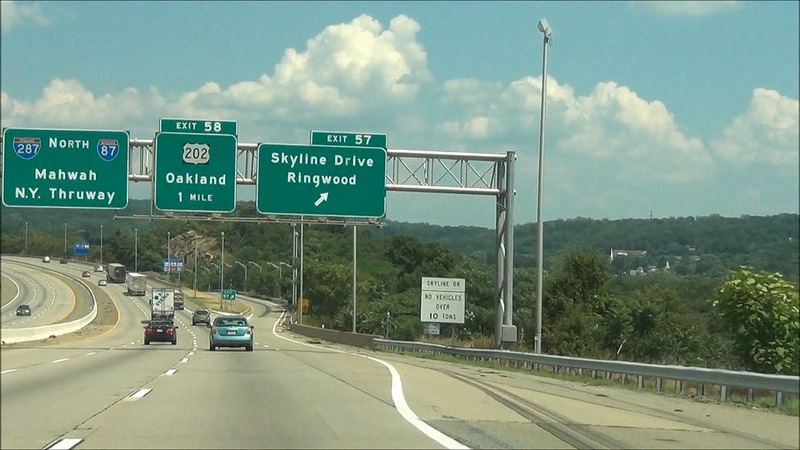 Interstate 287 North at Exit 57: Skyline Drive / Ringwood (Photo taken 7/24/12). 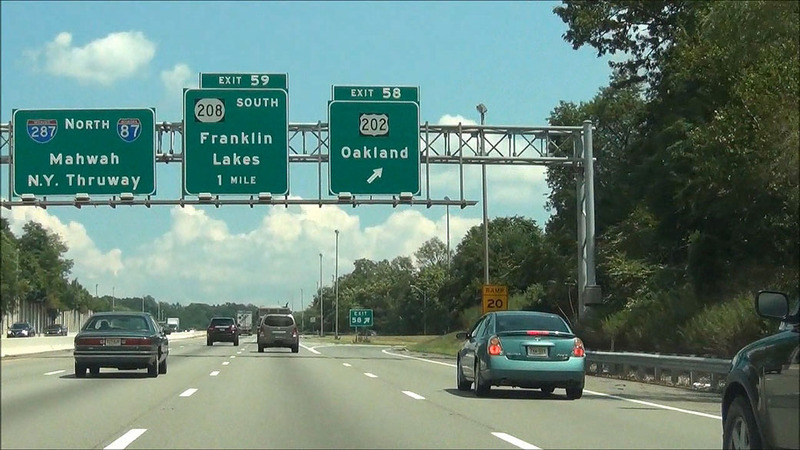 Interstate 287 North at Exit 58: US 202 - Oakland (Photo taken 7/24/12). 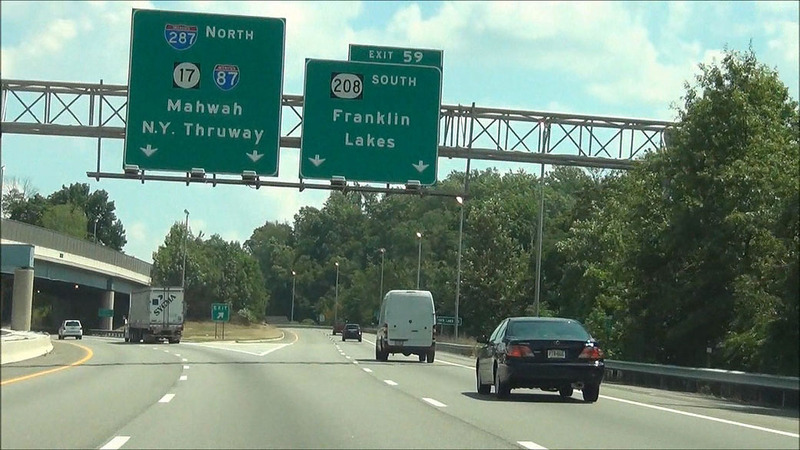 Interstate 287 North at Exit 59: NJ 208 South - Franklin Lakes (Photo taken 7/24/12). 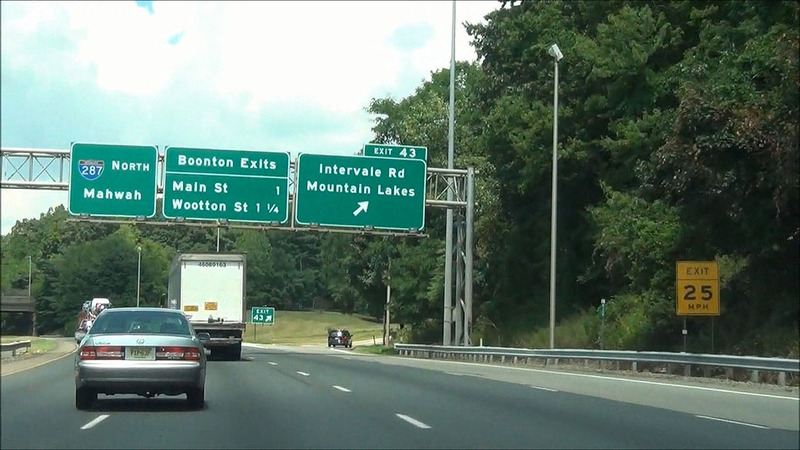 Sign near mile marker 64.7, indicating that motorists should use Interstate 87 North to Interstate 84 East to the New England states. (Photo taken 7/24/12). Use Exit 66 for Ramapo College of New Jersey. (Photo taken 7/24/12). 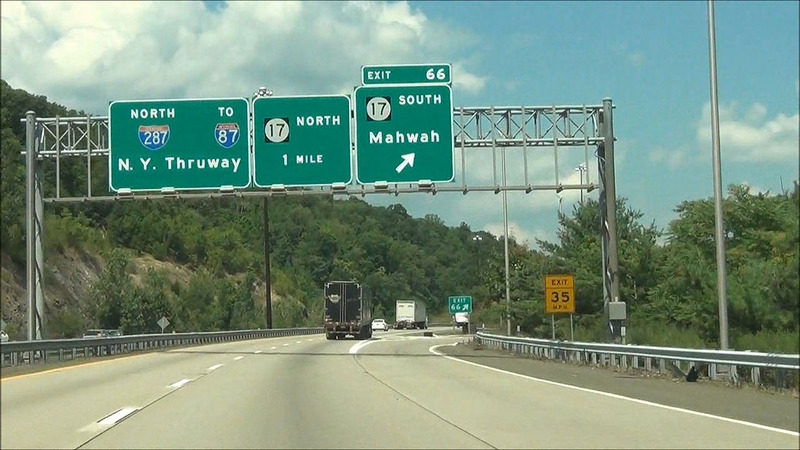 Interstate 287 North at Exit 66: NJ 17 South - Mahwah (Photo taken 7/24/12). 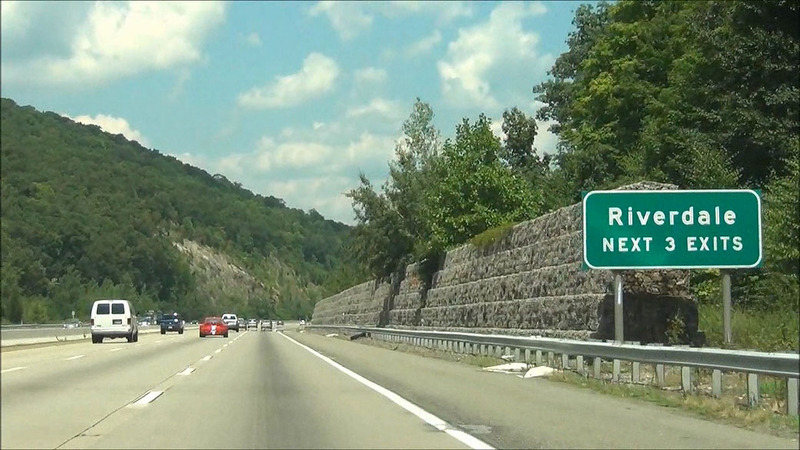 Interstate 287 North: Road view from mile marker 67.3, as the speed limit drops to 55 mph and you prepare to enter New York. (Photo taken 7/24/12).